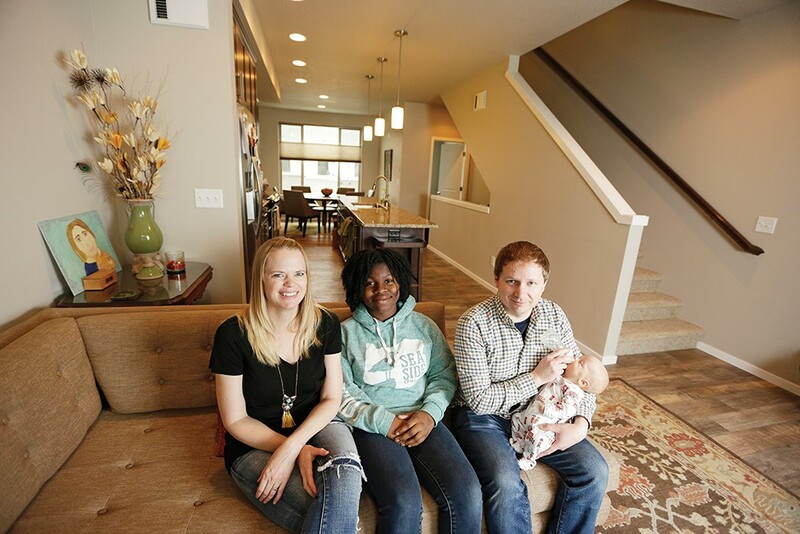 The Shears family — Sarah, Simone, Eric and baby Harvey (left to right) ­— at home in Kendall Yards. Casting aside excess and paring our possessions down to the essentials has held a certain appeal for millennia. It's a practice — usually in its more extreme forms — that has even come to characterize whole civilizations or religious orders, resulting in adjectives like spartan and monastic to describe a bare-bones lifestyle stripped of all frills. In this day and age, however, taking a more minimalistic approach to our living arrangements often seems like an impossible dream. Ours is a consumer culture, which means that many of us are awash in belongings, objects, things — stuff. And that stuff requires space, whether it's in regular use, out on display or tucked away in storage. Scaling back is widely regarded as a noble goal, but it's assumed to be achievable only by that subset of the population who are already of retirement age, or willing to make serious sacrifices in terms of convenience and comfort. Yet more and more people are beginning to question that assumption — along with the necessity of their stuff, and all the space it requires. Instead, they're starting to examine the trade-offs that all that excess entails, and looking at their various trappings as, well, a kind of trap. To people in this situation, the process of downsizing — that is, moving into a smaller home and shedding some or even most of their material possessions — is becoming increasingly attractive. Randy Wells is a Spokane-based real estate agent who has witnessed a noticeable uptick in the number of home buyers looking to downsize. "I've been doing this for 23 years, and being at it that long I can see some trends. In 2005, 2006, 2007 when the market was crazy, everybody kept trying to upgrade, to move up and get bigger. Ever since the big crash, that's not happening anymore. Most of the people are really trying to simplify. A good majority of people are saying, 'You know what? I don't need the 5,500-square-foot house. It's too much.' And so there's definitely a trend for smaller," he says. Eric Shears says cleaning the family's smaller new home is "a breeze." Wells says the motivation to downsize, and the form it takes, can vary from person to person. For some, it means scaling down the size of their urban home while keeping a large cabin at the lake. For others, it means building a cottage home on a property that already contains a standard-sized house, then moving into the cottage and renting out the house. Still others will take the more traditional downsizing path of moving out of the longtime family home and into a smaller-scale retirement community with bungalows or patio homes. For Whitworth University professor Kathryn Picanco, downsizing became a tempting option when she and her husband Kevin, an engineer for the city of Spokane, were contemplating the sheer scale of their roughly 5,000-square-foot home on the upper South Hill. While offering "lots of space for the kids to play in during the dark, cold winters," it had always seemed a stark contrast to the more modest 1,200-square-foot home they had owned in San Jose, California, before moving to Spokane in 2003. "We just started thinking about maybe not being quite so tied to the house — re-looking at what our priorities were and making conscious decisions [about] finances and cost, and how we were using our time in general," she says. "Because it was a lot of upkeep, having to spend a lot of time on the yard and interior of the home with cleaning and renovations." The space afforded by the larger house became burdensome in more subtle ways. The large rooms called for furnishings so as not to look empty, which led to a years-long hunt for tables, chairs and shelves. Some of those objects came in the form of "hand-me-downs" from nearby family, says Picanco, "which was great, but it was never very personalized." 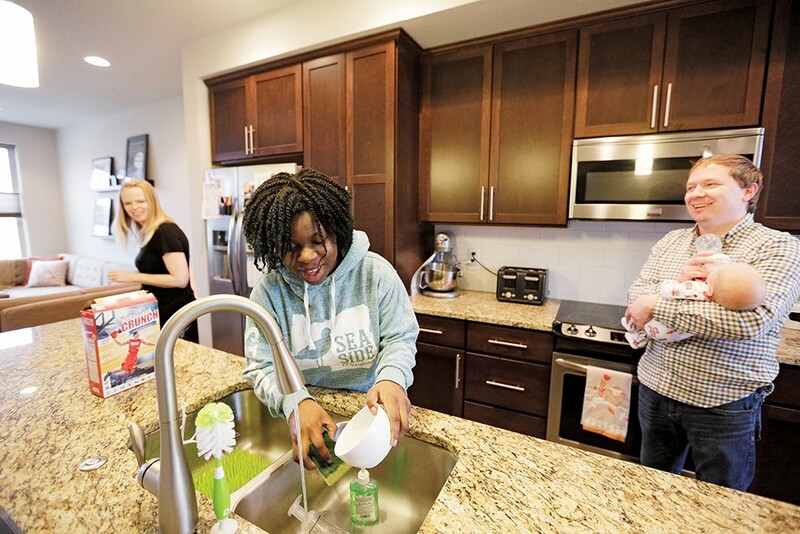 In autumn of 2015, the Picancos and their three children, ages 16, 14 and 11, chose to move into a home a little over half the size of their former one. Although still situated in the same general area of Spokane and laid out with the same number of rooms, the downsized home has already delivered its anticipated benefits. "Coming to the smaller house, everything seems so much more manageable," Kathryn says. "It's alleviated a lot of day-to-day stress and let us focus more on family and the kids, doing fun activities with them. We just spend more time together, because we're not spread out all over the place. We had a lot of closets [in the old house], too, and quite frankly, it was hard to find things because they were tucked away behind other things that we might not necessarily have needed. It feels great now not to be living in all of that extra stuff." Much like the Picancos, Eric and Sarah Shears found themselves wondering if their large South Hill residence — in this case, a 3,600-square-foot historic Victorian — was best suited to the quality of life they wanted. "It had four bedrooms, a library, huge kitchen, massive rooms. And it was great, but it was just so much work. Every weekend there was another project to do, either house projects or yard work," Eric says. His wife's job as a therapist and his in IT kept them busy enough during the working week, and they saw downsizing as an opportunity to free up their weekends to spend time with their 13-year-old daughter. But the Shears family ended up taking a very different route to their destination. Last year, they purchased a two-bedroom townhouse on the north side of the river in Spokane's booming Kendall Yards. The new home marked a significant reduction in square footage, but required much less time and effort in maintenance. It also reduced their mortgage payments by several hundred dollars per month — money they can now redirect toward different priorities, such as family outings. One reason his family felt comfortable scaling down to such a degree is because they had already lived abroad quite happily in London, where living space comes at a premium. "We were there for a couple of years," Shears says. "We had a flat that was a lot smaller, only about 800 square feet. The third bedroom was barely a walk-in closet. But we really did fall in love with that culture, that European approach to transportation and walkability and more simple living. Typically, people there don't have huge houses with giant basements and garages and big yards. I think it did kind of prime us for that downsize." After several months in the new house, Shears says that cleaning seems like "a breeze." "We can do it in a couple hours, whereas with the old one, we had to take breaks and do it over a couple days. Less time cleaning means more time spent with each other." Another advantage has been "purging ourselves of all these material items that we just don't use." But even in smaller homes, life can sometimes throw you a curveball. When the Shearses initially made the call to swap their Victorian for a townhouse, they based their decision on their family makeup at the time: two adults and a teenager. But that changed in the interim. "We have a baby boy who's 5 weeks old now, and the baby was unexpected before we decided to downsize," he says. "Which kind of makes it more interesting. We just bought a two-bedroom house for four of us. So we have to think about how we're going to make that work."